Hello! 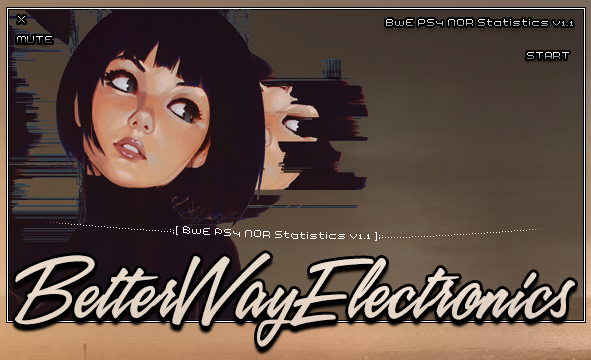 After my BwE PS4 WiFi / BT Patcher & Extractor this program BwE PS4 NOR Statistics v1.00 followed by Version 1.1, another micro version of my PS4 NOR Validator, is designed solely to validate your NOR based on statistics only from Better Way Electronics! Seeing as the PS4 firmware is likely to add more or less complexity with each update I have made available a settings file where you can adjust the predicted statistics. Have fun! And yes this is made specifically for other PS4 repairers like myself. Maybe it will be useful for something else one day. Remember the fun we had with the PS3 NOR? Also for those who enjoy a trip down memory lane, here's blast from the past via HackADay.com on how the original Sony PlayStation was hacked. Taufik, c4our20, Merdas and 8 others like this. 1.0 (5/11/18) - First Release! Lol really? It's no big achivement. Awwh thanks. I just think it's stupid to abandon ones work. But then again, I update my programs as an excuse to change the loader. Its what I enjoy the most lol. Speaking of abandoned work, I might release the source for my NAND validator. Do you want it? I could fax it. It's now Apr 24, 2019 at 3:53 PM.